Dixon, G.B., Davies, S.W., Aglyamova, G.V., Meyer, E., Bay, L.K. and Matz, M.V. 2015. Geonomic determinants of coral heat tolerance across latitudes. Science 348: 1460-1462. The persistence of coral populations in light of model-predicted future increases in ocean temperature due to global warming has long been a concern among researchers and policy makers. However, original pessimistic forecasts made over two decades ago of widespread coral demise - and even population extinctions - have given way to more optimistic predictions of their health and survival in recent times. A large reason for this perspective swing is the growing base of knowledge demonstrating the ability of corals to successfully acclimate and/or adapt to temperature stress. Physiological acclimation is generally assumed to be the more common (and most rapid) mode of stress response among long-lived organisms like corals. Indeed, recent work by Bay and Palumbi (2015) indicated a "striking increase in heat tolerance" among the reef-building coral Acropora nana after a mere seven days of temperature acclimation. However, new evidence from the work of Dixon et al. (2015) now reveals "the potential for rapid adaptation at the genetic level based on standing genetic variation." This latest revelation of good news was published in the journal Science and highlighted research conducted on Acropora millepora corals inhabiting two thermally divergent locations separated by 5° of latitude on the Great Barrier Reef: Princess Charlotte Bay and Orpheus Island. For their analysis, Dixon et al. established ten crosses according to a diallel scheme by "cross-fertilizing gametes from four adult colonies from the two locations." The heat tolerances of the larval crosses were thereafter analyzed based on their odds of survival after approximately 30 hours exposure to 35.5°C temperatures. Results of the analysis revealed a substantial variation in survival rates among the larval families, yet Dixon et al. report "the combined parental effects (i.e., broad-sense heritability) accounted for 87% of total deviance in odds of larval survival," while adding that the "proportions of deviance resulting from sire, dam, and their interaction were estimated at 11%, 66%, and 12%, respectively" (see the left panel in the figure below). 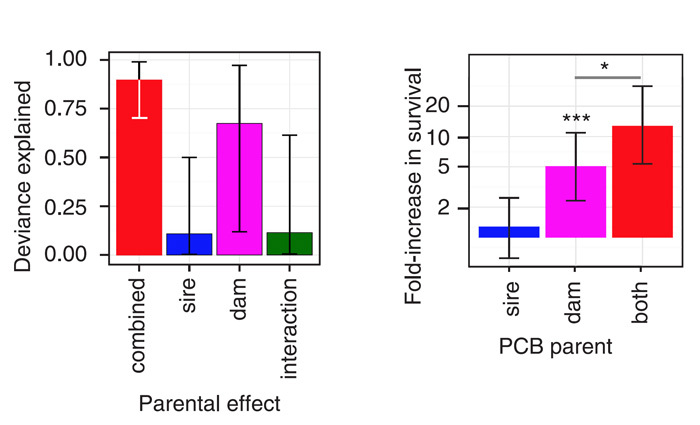 Perhaps the most significant observation, however, was the finding that "parents from the warmer location (Princess Charlotte Bay) conferred significantly higher thermo-tolerance to their offspring relative to parents from the cooler location (Orpheus Island); as shown in the right panel of the figure below, a dam from warmer Princess Charlotte Bay conferred a fivefold increase in survival odds and a sire from Princess Charlotte Bay conferred an additional twofold increase." Figure. Left panel: Proportion of total deviance explained by parental effects. Right panel: Increase in odds of larval survival with parents from the warmer location (Princess Charlotte Bay) relative to the larvae with both parents from the cooler location (Orpheus Island). ***P < 0.001, *P < 0.05. Error bars denote 95% credible interval of the posterior. Adapted from Dixon et al. (2105). Dixon et al. also subjected several samples from their larval families to tag-based RNA-sequencing analysis. The findings of those analyses, coupled with their offspring survival data led them to conclude that their study "demonstrates heritability of coral stress-related phenotypic and molecular traits and thus highlights the adaptive potential stemming from standing genetic variation in coral metapopulations," for which they thereafter list several lines of evidence pointing toward this conclusion, including (1) a predominantly maternal inheritance, (2) altered expression of mitochondrial proteins in heat-tolerant larvae, (3) persistent selection against paternal haplotypes in reciprocal crosses under heat stress and (4) two genes encoding mitochondrial proteins in the vicinity of the major heat-selected marker. With respect to this last line of evidence, they add that "the strong response of two genomic regions to heat selection directly confirms that natural variation in heat tolerance is both heritable and evolvable." The take-home message of Dixon et al. 's work, in their own words, is that "the genetic rescue scenario, therefore, emerges as a plausible mechanism of rapid coral adaptation to climate change, especially if the natural connectivity of corals across latitudes is enhanced by assisted colonization efforts." In other words, in addition to acclimation, corals likely have another important tool in adaptation, which can operate over relatively short timescales to allow corals to successfully cope with any future changes in ocean temperature. Bay, R. A. and Palumbi, S.R. 2015. Rapid acclimation ability mediated by transcriptome changes in reef-building corals. Genome Biology and Evolution 7: 1602-1612.